December | 2013 | Mom of Tornado - The realization of the last 30 something yrs. 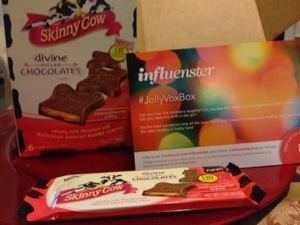 Skinny Cow Divine Filled Chocolates Candy -Super excited when I saw a box of YUMMY Skinny Cow products. I have purchased Skinny Cow in the past so I knew I would not be disappointed by the treat. With only 130 cal per packet you can’t go wrong. One pouch has 3 pieces that you can share or keep for yourself. I love having one piece to satisfy my craving. But if I do eat it all I won’t feel so guilty because it only has 130 cal. The chocolate has a great taste, melts in your mouth and leaves no after taste at all. The peanut butter was super creamy and blended well with the chocolate. I will defiantly be purchasing more of these to have around. 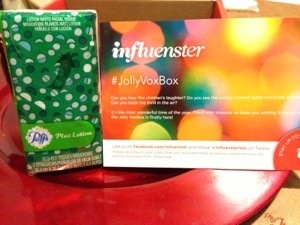 Puffs to go – Next I saw a packet of Puffs to go. You can never go wrong with a packet of Puffs to go in your purse, backpack or diaper bag. Puffs is a super soft tissue that can be used to blow your sensitive nose or wipe off that excess make up. I always carry tissue with me so this was perfect. Rimmel London Show Off Lip Lacquer – How gorgeous is the packaging. It went on nice and creamy and gave me a great hint of color. Nice and shiny with no stickiness or tackiness. Big plus was the great scent it has. 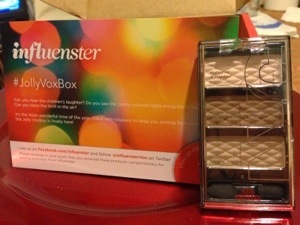 I’m very turned off by lip products that have an odd smell so I was very pleased with the scent this lacquer gave off. Defiantly will purchase more in this line. NYC HD Color Trio Eye Shadow – I really was surprised by this trio. The colors are perfect for a subtle day look and if you add a nice cat eye liner you can defiantly transition this into night. The colors were nice a rich and very pigmented. Mini Ducklings Duck Tape – Let the crafting begin. As soon as I saw this little guy I saw all the projects I could do with this. The tape is easy to roll out, and easy to cut. Does not stick to your fingers like some tapes might. The patterns is also very nice I can’t wait to see what other patterns they have out. 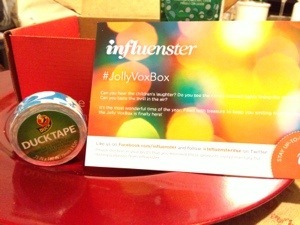 Thank you Infulenster for supplying me with this great VoxBox and for the products inside. Let me know what you think of the products listed. Have you tried any of them? Leave me a comment I love hearing from you. Don’t forget to follow me on Twitter and Facebook. 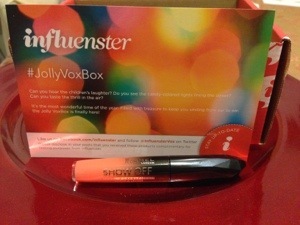 Disclaimer: All products were received complimentary for testing purposes from Influenster. Can we say busy holiday season? In a one, two, three Christmas has snuck up on me. In just a few days jolly Ole Saint Nick will come down the chimney to give out his goodies to all the good boys and girl. 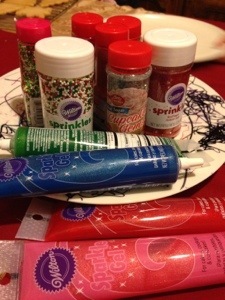 So finally in preparation for Santa we decided to bake and decorate some yummy sugar cookies. My little one was super excited about this , so was I since this would be the first time we attempted this. 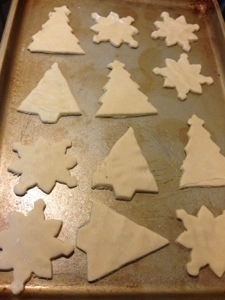 I ran out, purchased some pre packaged dough (because a baker I am not) and some icing with easy to use tips so that my son could easily decorate the cookies. I have to say we defiantly had a blast doing this and they tasted great. It did take us a total of 2 hours from start to finish. 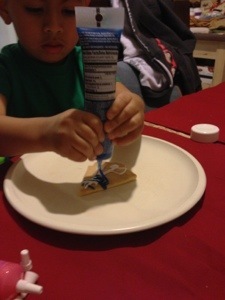 My little one used his imagination and even figured out how to spread the icing all over the cookie. I did make the mistake of uncapping one of the sprinkles shakers because as soon as I was not paying attention my little one poured the whole things over his cookie. He looked at me and all I could do was laugh because it was one of those learning experiences for both of us.. We had some Christmas tunes playing in the background which placed us in the Christmas mood. Since we , mainly me are all the cookies already, we will be making more cookies on Christmas Eve so we can leave freshed baked goodness for Santa. 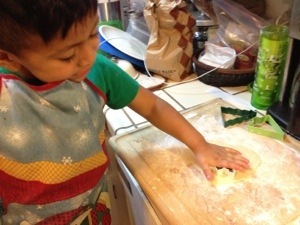 Next year I will attempt to make my own dough (wish me luck), but I think for our first go round it was a success. I have to give a huge HIGH FIVE to my friends who bake for the holidays. 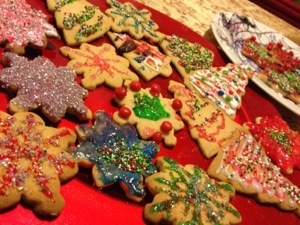 We only made like 15 cookies, but the rolling, and cutting and then decorating was a lot of work, fun since these were for our own use. But those ladies and gents that make then to give away, WOW, truly an art. My taste buds thank you big time. Have you baked this holiday Season? What is your favorite recipe?? 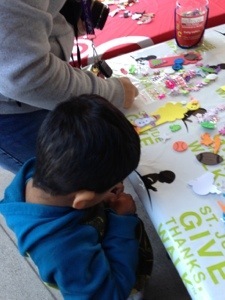 On November 23rd, we had the pleasure of participating in the St Jude Give Thanks. Walk #givethankswalk in San Francisco at the San Francisco Zoo. We walked 2 miles around the Zoo and then were welcomed to come back to enjoy the rest of the day at the zoo. It was so heartwarming to see everyone come out so early to support a great cause. We heard from current patients of St Jude and how with everyone’s help they are able to obtain treatment and support in such a difficult time. St Jude is a wonderful organization that ensures that there patients are taken care of 100% . 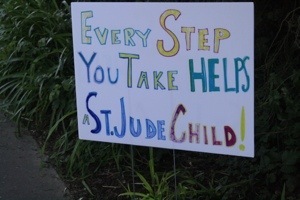 Please visit www.stjude.org to learn more about this great organization and to make donations if possible. Together, we can raise money to ensure that no family ever pays St. Jude for anything. St. Jude is changing the way the world treats childhood cancer and other deadly diseases through its groundbreaking research — and we can help them do it. Because St. Jude shares its research freely, every child saved at St. Jude means thousands more saved around the world. After the walk we were able to enjoy the beautiful San Francisco Zoo and my own little monkey was excited to see the Lions, Giraffes and Zebras. What do you give thanks for??? I give thanks for the healthy child in my life, my friends and my family. 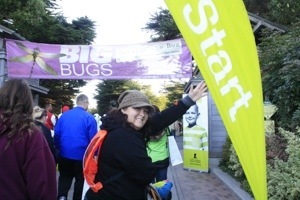 Did you participate in a St Jude Walk? · All opinions are strictly my own and my participation was voluntary.